The career of a shadowrunner is very much like that of many summer insects. Short, flashy, and a moment of bad luck will get you swatted. Shadowrun Crossfire is the latest release from Catalyst Games. It brings many of the ideas from the pencil and paper roleplaying game and distills them down into a cooperative deckbuilding game. But does two hundred and four cards do enough to put you in the Sixth World? For those not familiar with Shadowrun, this section is for you. (Skip down two paragraphs if you're already familiar with the setting.) It is 2072. Megacorporations have become the norm for the world. The United States has split into multiple smaller countries, with some taking on the identity of their most influential corp. Cybernetic enhancements are common and plentiful. The Internet has changed into The Matrix (no relation), where the most skilled programmers are Deckers, using mind/machine interfaces to navigate it. The box, with clearly room for expansion. But most stunning of all is that magic has returned to the world. Dragons ply the skies alongside commercial airliners. Elves, trolls, dwarfs and more walk the streets of the 'Sixth World', and the fae creatures can be encountered at every turn. Players take on the roles of these humans and metahumans, trying to eck out a living as a Shadowrunner, a mercenary for hire. They take on the jobs that the more visible paragons of the world don't want to become public. And if they are quick and canny enough, a Shadowrunner might retire in just a couple of years, rich but with a long list of enemies to think about. At its core, Shadowrun Crossfire (herein, just SR:Crossfire or Crossfire) puts you in the shoes of a Street Samurai, Decker, Face, or Mage and challenges you to come out alive and successful in one of three scenarios. You will start with a seven card deck customized for your role, and encounter obstacles, buy from the black market, and hopefully duck when a new event card hits the table. The core of the game has you facing various obstacles, either normal or hard based on the number of players and scenario. These obstacles have symbols and numbers along the top showing what you need to do to defeat them, as well as a damage value, a nuyen value, and text that might affect you while it is in play. You play cards from your hand, matching them up with the levels across the top in an attempt to clear all the levels in their listed order and defeat the obstacle. Every turn you fail to clear it, the obstacle applies its damage to your character. When you do defeat it, your team gets to split the nuyen value of the card. After playing cards from your hand and dealing with the damage from the obstacle, you draw in new cards and buy cards from the black market into your hand. Then it is the next runner's turn. The wrench in your plans is known as the Crossfire deck. 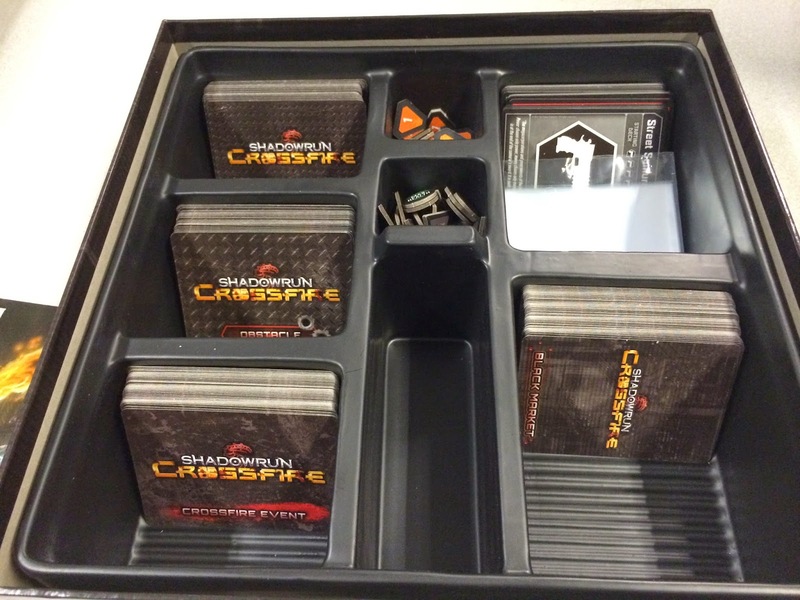 When the game gets around back to the first runner, he or she draws a new Crossfire card. These cards only rarely have good events for the runners. Very typically, something bad happens. Sometimes it is an extra obstacle being played to the table. Other times it forces you to discard cards, or just outright damages you. On top of that, lots of the Crossfire cards have a threshold listed on them. If it says 4+ and there are four cards in the Crossfire discard pile, then that means the card uses its secondary effect. So the longer a Shadowrun goes on, the more difficult it gets. The three scenarios included in the game each have their own ebb and flow, set up on the scenario card. Crossfire has the runners taking on three scenes. Clear the obstacles dealt to you in each scene, advance to the next. The Client requires you to protect a special client (represented by a card and having its own turn and HP values) for seven rounds. Finally, The Dragon is a scenario for players who have earned enough Karma (the Shadowrun Universe's name for experience points) and upgrades. The Dragon can come out blazing, or play hide and seek, and has rules depending on what state it is in. Winning is the primary way to earn Karma for your characters, though some of the scenarios let you abort if the run gets too difficult, letting you earn less Karma. This sounds unusual until you realize that the game is very difficult. I personally have played the demo kit four times and the Crossfire scenario once, and actually have not yet won once. Karma is used to buy upgrade stickers that are placed on your character sheet. These can vary from starting with an extra nuyen to putting an extra card into your deck at the start of the run. Over time, there are some very powerful upgrades that you can add to your character card, up to a 50 point Prime Runner sticker. A two player game in progress. Current Crossfire card in the middle. As I mentioned before, this game is tough. While this trait is common with many cooperative games, it has resulted in multiple losses for me since I have started to play it. I have been mostly playing solo or two players and have read comments that three and four player games are more balanced. I hope to test that soon (and will post an update to this article when I can.) The cards and components are very well made. Once you have looked at the quick start rules included in the box, the icons and card layout is very easy to understand at a glance. I think the part of the game that will concern most players are the upgrade stickers. There are ten runner cards in the box, a male and female version of each metatype present in the Shadowrun setting. As you earn Karma you will attach these stickers to the character sheets or even put stickers over other stickers. This will result in a very customized character card at the expense of game components. I have seen some complaints in the boardgaming world about this, though it can be resolved in several ways. You can always just write down what a runner has earned and the stickers they have purchased. You can place the stickers on comic backing board and then cut them out with a knife. Or you can just play the game as it was presented. Catalyst Games has a add-on pack that is available with ten more runner cards in it, and a full set of stickers. They have also mentioned that bringing your character to conventions and events may earn you special stickers not included in the base game, hinting at the possibility for Organized Play events. Overall, this is a very interesting deckbuilding game. I look forward to more scenarios, both official and fan made, for the game. A lot of people familiar with Paizo's Pathfinder Adventure Card Game are going to come to this one because of the mention of a campaign. As of yet, no long term story is evident nor has any follow up product been announced in the same vein as the Adventure Decks from Paizo. You will not find the same kind of narrative here but you will find an edge of your seat adventure none the less. This is an hour well spent for boardgame players who want to experience the Sixth World. Tom Tjarks is a Fort Worth native and avid game player (PC, Console, Board Games) He has previously written for GamingTrend.com and can be found asking lots of questions about games on Boardgamegeek. @tntjarks on twitter, Dreamshadow on Boardgamegeek and other forums.